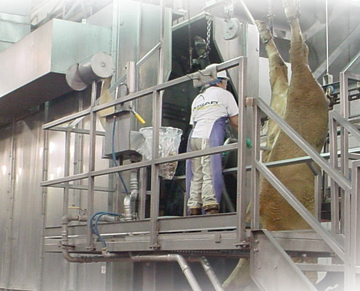 Pork Processing: Viscera - Hydro-Thermal Corp.
A large pork processing plant needed to supply 180°F water to critical applications throughout the plant with fluctuating flow rates. The main challenge was to find the true flow rates in order to size the system properly for different variables. The viscera process (removal of internals and wash-out of cavity) stays at a constant 75 gpm but has a variety of hoses, saws and sanitizers which makes the flow range from 75 gpm up to 200 gpm at different times during the day. The primary concern is always maintaining 180°F+ at the point of use to avoid shutdowns and downtime, and secondly, reducing energy and maintenance costs. Hydro-Thermal® designed and installed a 3” EZ Heater Skid system to replace a shell and tube heat exchanger and utilized the tank as a buffer to smooth out the fast flow fluctuations (turndown). The EZ Heater Skid system pulls hot water from rendering operations at approximately 130°F and heats it to a consistent 190°F on the floor (under 180°F causes plant shutdowns that cost $300/min of downtime, over 200°F burns on tallow to pans, knives and conveyors). Exact details of pipe sizings, applications and flow rates enables the system to keep a constant temperature on the floor and meet the stringent demands of the USDA.